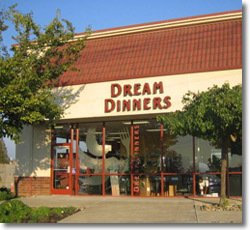 If you are looking for information on the Dream Dinners franchise business opportunity, Dream Dinners franchises or Dream Dinners franchising, then you have come to the right place. Thank you for your interest in a Dream Dinners franchise opportunity. We created the meal-assembly concept and founded our company on a mission of helping busy families eat together around the dinner table. We stand out from our competition because of our high level of integrity, values and commitment to our owners who are committed to our mission. The Dream Dinners brand represents who we are and how we live in the marketplace. Dream Dinners provides everything our guests need to assemble dinners they take home, freeze and serve to their families during the weeks ahead. We offer freedom from the hassles and headaches of planning and preparing meals, while also offering friends and family an opportunity to come together in a fun-filled setting to assemble Dream Dinners. Our core guests are working or busy women, between 25 and 54 years of age. Their family income is in the middle to upper-middle range and they have school-aged children with whom they are active. We promote and further our brand through our voice while using imagery that resonates with guests, and is consistent with all other experiences of our brand, as well as through our core marketing programs and strategic partnerships. All of our owners are provided with an intensive training program, continuing education and support, operational tools and regular communication from the home office. In addition, we have a dedicated coaching staff who partner with owners, providing them mentorship and instruction in best business practices. Our professional home office staff are passionately driven to nurture and serve our owners who we consider extended family. March 2002 - created the concept. June 2003 - first meal-assembly business to establish a national franchise. May 2005 - named by Time Magazine as the "...grandmother of the idea." May 2006 - founders Tina Kuna & Stephanie Allen named by Ernst and Young as Entrepreneurs of the Year in the Pacific Northwest, consumer products division. January 2007 - Ranked #5 in the 2007 Franchise 500 in Entrepreneur Magazine. 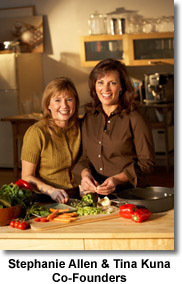 Dream Dinners has been featured in magazines, newspapers, radio and television around the world including the Food Network program in January, 2006.